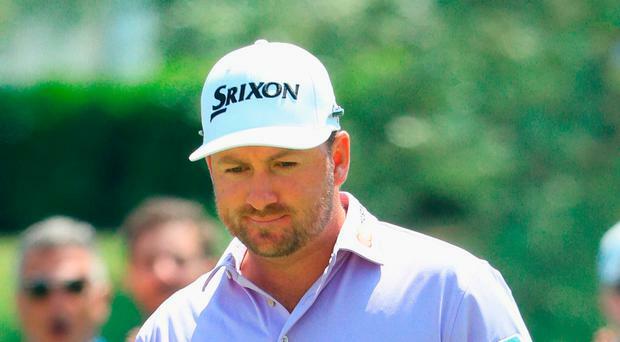 Graeme McDowell might have driven “like a clown” but has his eye on the big Ryder Cup circus after a second successive 66 left him just a shot off the pace in the $7m (£5.2m) Italian Open. As Rory McIlroy struggled late in his round at The Memorial Tournament in Ohio but scrambled to a 70 to make the cut, McDowell (38) found a way to overcome his troubles to lurk just a shot behind surprise leader Martin Kaymer on 10-under par. “To be in this position through two rounds, having not played well, is obviously pleasing,” said McDowell, who shares second place with fellow Ryder Cup players Rafa Cabrera Bello, Thomas Pieters, Francesco Molinari and Danny Willet. “I think it’s just coming here, having a little confidence. TV coverage captured him roaring, “I’m driving it like a clown” to himself at one point in his bogey-free effort as another drive headed for the trees. But brilliant iron play and razor-sharp play on and around the greens kept him going, and if he finds fairways and continues to putt well, he knows he has a chance. “On a golf course like this where I get a lot of drivers in my hand, I typically can use it as a weapon, and both days I haven’t driven it well,” McDowell said. He’s also feeling liberated after being named as one of Thomas Bjorn’s five vice-captains and knows a win would revive his hopes of a fifth Ryder Cup appearance at a venue where he has won two French Opens. “I’d dearly love to compete in these Rolex Series Events, if not win one,” said McDowell, who has been winless for two-and-a-half years. “It would do a lot for me, would do a lot for my summer, a lot for my Ryder Cup bid and a lot for my confidence in general. “My head will be down this weekend and I will be grinding really hard. While Kaymer (33) hasn’t won an event since he captured the 2014 US Open at Pinehurst, he still thinks like a two-time major winner. “It doesn’t matter if you’ve won majors and if you had those situations at The Ryder Cups,” the former world number one said after carding eight birdies in a flawless second-round 63. “It’s really exciting to be in a position that you can win a golf tournament again. “It was just a matter of putting the right mental attitude on to the golf course. I did very well the last two days. Padraig Harrington shot a vintage, bogey-free 66 to share 41st on five-under as Paul Dunne battled to a 69 to make the four-under cut on the mark. But it was hard work for McIlroy, whose patience was wearing thin late in his second round at Muirfield Village. Cruising at two-under after making four birdies in his first 13 holes, he ended up wobbling down the stretch. While his driving was almost flawless, he found water with his approach and bogeyed the par-five fifth, his 14th, then bunkered a 90-yard wedge at the par-five seventh to drop another shot. He had to make a six-footer for par at the short eighth and play safe for par at the last to remain inside the cut line as his playing partners took full advantage of soft, windless conditions. Jason Day shot a second successive 68 to share the clubhouse lead with Wesley Bryan (68), Hideki Matsuyama (71) and JB Holmes (66) on eight under while Dustin Johnson, armed with his old putter, cruised to a laconic 66 to get to six-under. Meanwhile, Tullamore’s Stuart Grehan is tied for 35th at halfway in the Swiss Challenge, 12 shots behind leader Marcel Schneider on three-under after a 70 with Ruaidhri McGee (69) two-under and Cormac Sharvin (72) one-under. At the Staysure Tour’s Shipco Masters in Denmark, Brendan McGovern is two shots behind Argentina’s Rafael Gomez, tied sixth after four- 68 with Des Smyth and Paul McGinley tied ninth after 69s. Banbridge’s Olivia Mehaffey shot 77 to miss the cut on nine over in the U.S. Women’s Open at Shoal Creek where Australia’s Sarah Jane Smith shot a second successive 67 to take an early four-shot lead over compatriot Su-Hyun Oh on 10-under. In the Europro Tour’s Matchroom Sport Championship, Meath’s Brian Casey closed with a nine-under 63 to finished tied for third with Whitehead’s John Ross Galbraith (66) on 13-under, just two shots behind Billy Spooner.